In the early spring of 1775, on a farm in Concord, Massachusetts, British army spies located four brass cannon belonging to Boston’s colonial militia that had gone missing months before. British general Thomas Gage had been searching for them, both to stymie New England’s growing rebellion and to erase the embarrassment of having let cannon disappear from armories under redcoat guard. Anxious to regain those weapons, he drew up plans for his troops to march nineteen miles into unfriendly territory. The Massachusetts Patriots, meanwhile, prepared to thwart the general’s mission. There was one goal Gage and his enemies shared: for different reasons, they all wanted to keep the stolen cannon as secret as possible. Both sides succeeded well enough that the full story has never appeared until now. 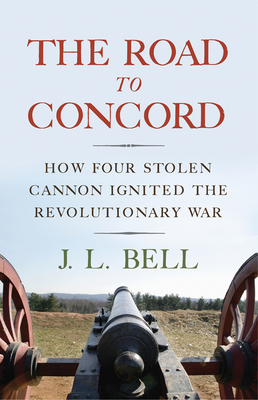 The Road to Concord: How Four Stolen Cannon Ignited the Revolutionary War by historian J. L. Bell reveals a new dimension to the start of America’s War for Independence by tracing the spark of its first battle back to little-known events beginning in September 1774. The author relates how radical Patriots secured those four cannon and smuggled them out of Boston, and how Gage sent out spies and search parties to track them down. Drawing on archives in the United States, United Kingdom, and Canada, the book creates a lively, original, and deeply documented picture of a society perched on the brink of war. J. L. BELL is the proprietor of boston1775.net, a popular website dedicated to the history of the American Revolution in New England. A Fellow of the Massachusetts Historical Society and American Antiquarian Society, he is author of the National Park Service’s study of George Washington’s work in Cambridge, and has delivered papers to the Massachusetts Historical Society, the Organization of American Historians, and historic sites around greater Boston.